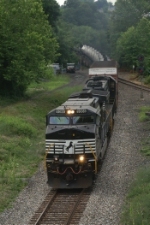 Description: NS 9366 - This is the unit that ran around with a primer mid-section for 2 years. Description: NS 9366 displaying a slight variation to the new "horsehead" scheme. Missing are the white brow and the solid frame stripe. Description: Train 35E passing the dragger at MP 431. Description: The two pieces of foreign power lead a heavy manifest, south, on BNSF's very underated D/FW Sub. The D/FW Sub seeslots of BNSF heavy manfests, grain, coal, and UP reroutesandlocals. 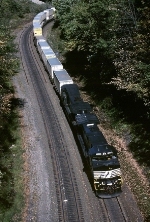 Description: Eastbound on track one with a quartet of GE widecabs. Shot was taken at Werner St. 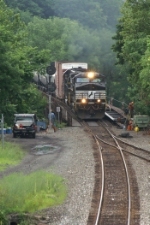 Description: NS 19G is passing under the signal bridge as it backs toward its train after making a pickup in the yard just east of the Hershey Chocolate plant. Description: 17th Ave., 1508 hours.